I am always on the hunt for vintage dresses during my thrift store adventures! Only recently, however, did I notice a collection of dresses from the 1970’s and 80’s beginning to take over my closet. When I was gifted a box of additional dresses from those decades, I concluded that the only solution was… to give myself a fashion challenge! Could I possibly wear 70’s and 80’s dresses for a week? The following rules applied: Rule #1: No period-specific vintage looks allowed. Bring the dress to the present. Rule #2: Only minor alterations/repairs (such as removal of shoulder pads) can be made on any dress. Rule #3: The outfit must actually be worn in public. Rule #4 Related experiences and conclusions must be documented for educational purposes. Obviously. I began the week with this vibrant shirt dress from the 1970’s. I was feeling admittedly self-conscious, so I kept my makeup classic and jewelry modern. A belt was totally necessary to rein in some of that polyester, while a navy cami warded off wardrobe malfunctions. The addition of navy lace-up boots was a little weird, but I rolled with it. I was somewhat surprised to get some compliments on the dress and its colors. I guess we need more blue, navy, black, mauve, and magenta dresses in the world? My only real issue with the dress was the limited breathability of the polyester. It was a LOT of polyester. As soon as I put this dress on, I was struck by how comfortable it was! With the addition of a black cami underneath, the bat wing sleeves and draped front were super flattering and allowed for excellent mobility. I stuck with minimalist shoes, but threw in some cheeky jewelry for necessary irreverence. (Check out my irreverent necklace-making tutorial here.) While wearing the dress, I felt that it didn’t appear blatantly vintage but could pass for a contemporary piece. One downside, however, was that the bat-wing sleeves don’t fit well in my everyday denim jacket. Since I love this dress, I will simply have to buy one of those chic wrap/shawls this season. No problem there. Day 3: Cotton Gold, Green, and Black Dress. This was probably one of the easiest dresses to wear, as there was no cami required. I was thrilled to find that my antiqued gold jewelry and olive boots were my definition of a perfect match. Although I could have added a belt to my accessories, simplicity seemed to be the more modern choice. My one issue with the dress was the smallness of the cuffs, even when unbuttoned. Thankfully, the day was not warm enough to require rolled sleeves. Warm weather returned to the forecast, making me grateful for short sleeves, although a white cami was necessary. The synthetic fabric was slightly scratchy, but I liked the drape of bodice and skirt. I was excited to find an excuse to wear a great 1950’s statement necklace! (I concluded that this was NOT a violation of rule #1, as the necklace and dress were from different decades.) I wore the ensemble to work, despite the fact that it was casual friday. My colleagues were noticeably puzzled, but I had a fashion challenge to uphold! Conclusion: great outfit, best for a non-Friday day. I saved this great, Gunny Sax-esque dress for the weekend. Although it required some mending, the dress was surprisingly comfortable with cotton fabric and smocked bodice. 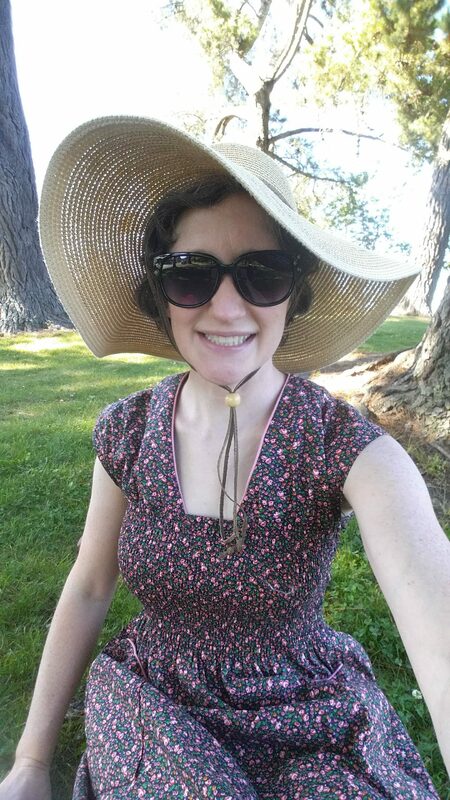 The weather was downright hot, so I accessorized with a large hat and somewhat ugly sandals. As I went for an afternoon walk, I felt that I was in keeping with the hippy vibe. I originally bought this vibrant dress for a vintage photoshoot, but the rules for the week’s challenge excluded such outfits. There was nothing left to do but to embrace the brightness and boldness of the dress… And add layers, lots of layers! Our Sunday drive to the coast made a coat, beret, big sunglasses, and surprisingly matching scarf allowable. To add to the experience, I adopted the clashing-shoes-worn-with-dresses trend and wore lace-up boots. I concluded that I looked like a spy villian in an 1980’s movie. My disguise was apparently effective, as some acquaintances passed right by me without recognition! Perhaps there is something to be said for the spy business. Otherwise, the outfit was very comfortable- I needed the layers for warmth but enjoyed the swishiness of the dress. Perhaps I could be a spy on holiday.